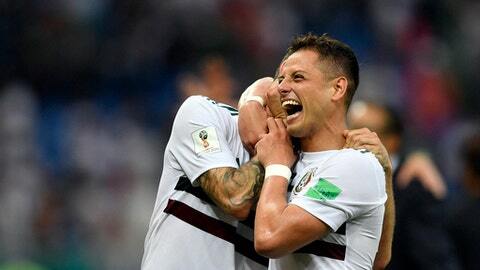 YEKATERINIBURG, Russia (AP) With back-to-back victories to open the World Cup, including one over defending champion Germany, Mexico’s national team has already been anointed by some back home as the best in the country’s history. If Mexico beats Sweden on Wednesday it would win its group with a perfect record, something it has never achieved in its long World Cup history. It’s exactly the kind of big dreams that 30-year-old forward Javier Hernandez was criticized for prior to the tournament when he said winning this year’s World Cup was a possibility. On Tuesday in advance of El Tri’s final Group F match against Sweden, he doubled down. Hernandez notched his 50th international goal in Mexico’s 2-1 win over South Korea on Saturday. With one more, he can become Mexico’s all-time leading scorer in World Cup play with five, breaking a tie with Luis Hernandez. Javier said no one inside Mexico’s locker room is disappointed about not having already earned its place in what would be its seventh consecutive spot in the round of 16. That’s mostly because nothing is settled yet in Group F. If Sweden beats Mexico on Wednesday and Germany beats South Korea, three teams would be tied atop Group F with six points, sending it to tiebreakers that start with goal difference. Having something to play for in this final group stage game fits right into this team’s mentality, Hernandez said. Mexico coach Juan Carlos Osorio is also embracing the expectations that have been placed on his shoulders. ”When we arrived here in Russia, the only person who had a big question mark over his head was me, not the national squad.” the 56-year-old said of leading his first Mexican World Cup squad. ”For many who are aware of Mexico’s history they say this is perhaps the best generation of Mexican footballers.